I am a new author out on the market and welcome honest reviews of my work. Please see samples of this at: http://www.hcheartland.com I look forward to hearing form you and to reading what you are reading! Enjoy this incredibly entertaining collection of fiction brought to you by the incredible H. C. Heartland. This new anthology features tales of science fiction, comedic drama, dramatic thrillers, and Mid-west American romance. It’s an amazing variety and depth in a collection of short stories from a new fiction sensation! H. C. Heartland is a rare find in the world of literary fiction. A talented creator of short stories that touch and move the reader in a real and emotional way, Heartland brings her talented imagination to bear in this newest collection of modern fiction. 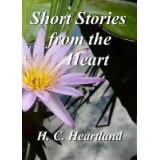 Heartland treats the reader to a touching telling of American Mid-western romance of the sweetest kind in Courage in a Coffee Cup, Falling Asleep at Midnight, and A Morning to Meander. Then, Heartland offers comedic drama in the island tales Lanto and Ferdinand’s Missing Red Hat. No, it doesn't stop there! Get ready for a suspense thriller in the roller-coaster short story, In the Light of Day and a Sci-Fi thriller in the amazing tale of Harold’s Helmet. Finally, Heartland gives the reader a light-hearted, rib-tickling, cherry-on-top with Chicken Pox Revenge. With a depth and variety seldom seen in new authors these days, Short Stories from the Heart will no doubt be a favorite for lovers of new American fiction.